BlackBerry maker Research in Motion today confirmed rumors that it is taking a stab at the streaming music business with the announcement of BBM Music. The new service integrates with BlackBerry Messenger, the company's popular messaging service, and gives users access to "millions of songs" from all four major music labels. But unlike rivals like Spotify and Rdio, which offer unrestricted access to their libraries, BBM Music limits you to 50 songs per month. For $4.99 a month you can create a personal music profile with 50 of your favorite songs. You can share these songs with all your BBM contacts -- as long as they sign up for BBM Music -- and you'll have unlimited access to all of the music on each of your friends' profiles, so in theory your music catalog can grow way past the original 50 songs. You can refresh the song selection on your profile each month, but for some reason, you're limited to swapping out up to 25 tracks. Within the app users will be able to see a visual timeline that shows the recent updates of all their friends, create multiple playlists from music in your and your friends’ profiles, and you can see which friend contributed each song while it plays. 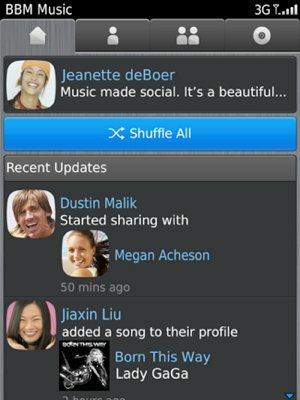 Keeping with the social aspect of BBM Music you can also comment on your friends' songs and playlists. Lastly, music can be saved to smartphones for offline listening, but it cannot be transferred to other devices. All in all this seems like a novel approach to music discovery and sharing but it certainly has its drawbacks. For one thing, you'll have access to a very limited catalog unless your friends happen to have a BlackBerry handset and subscribe to BBM Music. It also introduces a degree of complexity and uncertainty as you'll lose access to some songs as your friends swap them out from their profiles for new ones; instead of, you know, having access to the entire music catalog since you are already paying a fee. The fact that RIM is so late to the game might not even be a major issue considering the App World's selection of music apps is pretty limited at the moment. BBM Music won't attract new users to the platform, but at least long-time BlackBerry users will have a new music app alternative, if only while they keep waiting for something better. BBM Music is being tested in a closed beta trial starting todayin the U.S., Canada, and the UK and will launch in many more countries by the end of the year.